SFP transceivers are mainly used to link equipment in telecommunication and data communications like switches and routers. They support applications like 2G/4G Fiber Channel, SONET/SDH Network, Gigabit Ethernet, High-speed computer links, and with CWDM and DWDM interfaces. Today’s article will generally introduce the Cisco SFP transceivers including the Cisco 100M SFP, Cisco 1000BASE SFP, CWDM/DWDM SFP, SONET/SDH SFP as well as Cisco BiDi SFP to you. Cisco offers two different types of 100BASE SFP—100BASE SFP for Fast Ethernet (FE) SFP Port and 1000BASE SFP for Gigabit Ethernet (GE) port. Besides the above standards, the Cisco 100BASE SFP portfolio includes 100BASE-FX, 100BASE-LX, and 100BASE-BX SFPs. Cisco 100BASE-FX SFP operates on MMF for link spans of up to 2km. 100BASE-LX SFP operates on SMF up to 10km. 100BASE-BX SFP operates on SMF for a link length of up to 10km. A pair of a 100BASE-BX-D and a 100BASE-BX-U SFP is needed for the single strand deployment. 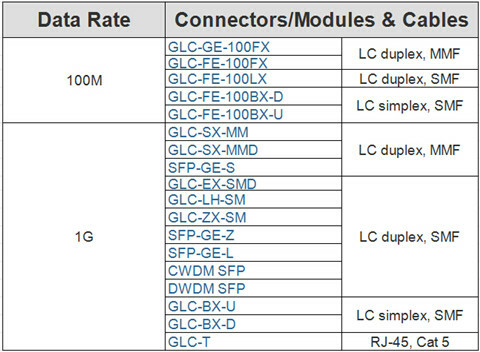 The following table displays the compatible Cisco 100M and 1G SFPs from FS.COM. Cisco 1G SFP transceivers offer a convenient and cost-effective solution for the adoption of Gigabit Ethernet and Fibre Channel in data center, campus, metropolitan area access and ring networks, and storage area networks. They are available in several Gigabit standards—1000BASE-T, 1000BASE-SX, 1000BASE-LH, 1000BASE-EX, etc. Take Cisco GLC-LH-SM as an example, it operates over standard single-mode fiber spanning distances of up to 10 km and up to 550 m over any multimode fiber (OM3/OM4). If 1000BASE-LX/LH SFP transceiver transmits in the 1300nm wavelength over OM1/OM2 fiber, it requires mode conditioning patch cables. Cisco Coarse Wave Division Multiplexing (CWDM) solution allows scalable and easy-to-deploy Gigabit Ethernet and Fibre Channel services. Similar with traditional SFP module, the Cisco CWDM SFP is a hot-swappable input/output device that plugs into a SFP port or slot of a switch or router. CWDM SFP transceiver modules make use of the SFP interface for connecting the equipment and use dual LC/PC fiber connector interface for connecting the optical network with a link distance of up to 80km. It usually comes in 8 wavelengths covering from 1470 nm to 1610 nm. Color markings on the devices identify the wavelength to which the Gigabit Ethernet channel is mapped. The following picture lists the FS.COM compatible Cisco CWDM SFPs with their wavelengths and color codes. DWDM (Dense Wavelength-Division Multiplexing) SFP transceivers, however, are used as part of a DWDM optical network to provide high-capacity bandwidth across an optical fiber network. Cisco DWDM SFP is a high performance, cost effective module for serial optical data communication applications up to 4.25Gb/s. There are 32 fixed-wavelength DWDM SFPs that support the International Telecommunications Union (ITU) 100-GHz wavelength grid. This Cisco SONET/SDH SFP is compatible with the SONET/SDH standards, and support the digital diagnostic functions specified in the SFF-8742 Multi-Source Agreement (MSA). Cisco SONET/SDH SFP can be directly plugged into a variety of ports on Cisco router interfaces. 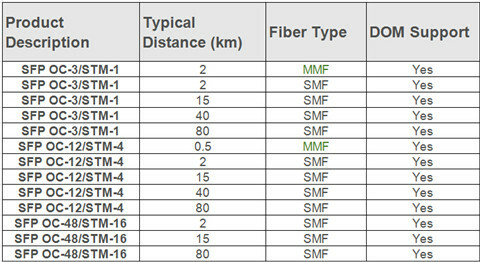 These SFP optics support OC-3, OC-12, and OC-48 data rates for multimode, short-reach, intermediate-reach, and long-reach (up to 80 km) applications just as seen in the below chart. Bidirectional (BiDi) SFP transceivers can transmit and receive data to/from interconnected equipment through a single optical fiber. BiDi transceivers are fitted with wavelength division multiplexing (WDM) diplexers, which combine and separate data transmitted over a single fiber based on the wavelengths of the light. BiDi transceivers must be deployed in matched pairs, with their diplexers tuned to match the expected wavelength of the transmitter and receiver that they will be transmitting data from or to. These transceivers offer bi-directional data links over single-mode fiber up to 120 km. Take 1000BASE-BX SFP BiDi transceiver as an example, 1000BASE-BX SFP modules are compliant with SFP Multi-Source Agreement (MSA) specification and SFF-8472, and conform to the IEEE 802.3ah 1000BASE-BX10 standard. 1000BASE-BX SFP modules include 1000BASE-BX-U SFP module and 1000BASE-BX-D SFP module. The 1000BASE-BX-D SFP operates at wavelengths of 1490nm TX/1310nm RX, and the 1000BASE-BX-U SFP operates at wavelengths of 1310nm TX/1490nm RX. These transceivers use standard simplex LC connectors for fiber cable connection and provide a long transmission distance of up to 10 km. It is necessary to select the suitable SFP transceivers for your network. This article has concluded several types of Cisco SFP transceivers, which might be a great help for those who are looking for Cisco SFPs. FS.COM, a leading and professional fiber optic SFP transceiver module provider, has a large inventory of 1000BASE SFP, 100BASE SFP, CWDM/DWDM SFP, BiDi SFP, etc. If you have any needs of our transceivers, please send your request to us.